Get a "printed" copy of the Student Survival Kit. Our printed editions (and apps) always feature our best deals. 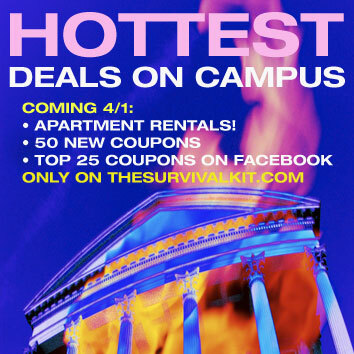 For our free apps, search iTunes and Google Play: Student Survival Kit Coupons. MSU Edition: The new edition will be in the MSU Bookstore 5 days before the beginning of the semester. Check the online edition for current coupons you can print at home, and install the free app. Search: Student Survival Kit Coupons. UM Edition: The new edition will be in The Bookstore at UM 5 days before the beginning of the semester. Check the online edition for current coupons you can print at home, and install the free app. Search: Student Survival Kit Coupons. OSU Edition: Watch your mailbox the first week of classes for the new edition at OSU. Check the online edition for current coupons you can print at home, and install the free app. Search: Student Survival Kit Coupons. UO/LCC/NCU Edition: Watch your mailbox the first week of classes for the new edition. A copy is placed in mailboxes of all UO on-campus students, and all NCU students. LCC students receive a free copy in their book bag at the Titan Store during book rush. 23,000 copies are distrbuted by targeted mailings (USPS) the first week of classes at UO and LCC. Check the online edition for current coupons you can print at home, and install the free app. Search: Student Survival Kit Coupons. UW Edition: New edition will be in the University of Washington's University Bookstore 5 days before the beginning of the quarter. Check the online edition for current coupons you can print at home, and install the free app. Search: Student Survival Kit Coupons. WSU Edition: New edition will be in WSU's Bookie 5 days before the beginning of the semester. Check the online edition for current coupons you can print at home, and install the free app. Search: Student Survival Kit Coupons. UI Edition: New edition will be in the Vandal Store 5 days before the beginning of the semester. Check the online edition for current coupons you can print at home, and install the free app. Search: Student Survival Kit Coupons. Palouse Edition: Mailed to 20,000 homes in Pullman and Moscow twice per year. Watch your mailbox in late May and late October. Check the online edition for current coupons you can print at home, and install the free app. Search: Student Survival Kit Coupons. Dining, shopping, student services and special deals created exclusively for Pacific Northwest college communities.